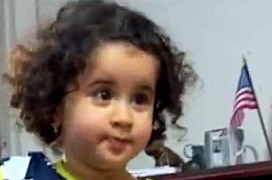 A family said they have been left 'humiliated' after they were ordered off a flight because airline staff claimed their 18-month-old was on a no fly list. The girl's parents, who did not wish to be identified, believe Jet Blue asked them to leave the flight as they thought little Riyanna was a terror suspect. An employee approached the family and said officers from the Transport Security Agency at the Fort Lauderdale Airport wished to speak with them. 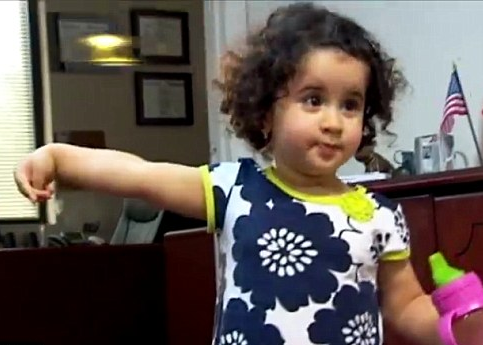 The parents believe they were stopped as they are both of Middle Eastern descent. Riyanna's mother wears a head scarf. Both were born in the United States and raised in New Jersey. They were flying from Florida to their home in New Jersey when they were stopped. After they left the plane, the family met with TSA agents and were made to stand in the terminal for half an hour, they said. The couple were told they could re-board the plane, but were not offered an apology or explanation, they told WPBF. But they refused to re-board the plane as they felt humiliated, they said. JetBlue, which is investigating the incident, said it was a TSA issue. But the TSA said it is an airline issue and therefore it is not investigating. Just days later, passengers at Newark Airport were delayed for hours when the Port Authority evacuated a terminal because of an unscreened infant. The TSA said that the parents of the infant passed the child back and forth through the metal detector, causing alarms go off. When TSA agents realized that the baby got away without an individual screening, they started a desperate search for the family to no avail. When they could not find them, they evacuated the entire terminal. And just weeks before, TSA agents were accused of subjecting a boy in a wheelchair to an invasive body search. His parents were not allowed to be near him as agents at O'Hare Airport in Chicago swabbed the boy for explosive residue in a security check. This is just sad, they should use their mind instead of being like a bunch of zombies. I accept the families claims that this is because they are Muslims because every child is born a Muslim no matter what their parents believed. Insha Allah may you keep going like this Islamic newsroom! I don't think there is a "no fly list". This fictitious list is a racial profiling tool used by the TSA to sidestep accountability and responsibility. We've seen it used time after time. By inducing artificail fear prepare to justify a major injustice yet to be committed. You plan, ALLAH plans, and you know who is the best planner. I dnt have any idea whr these ppl leave their heads when they come to work. I mean an 18 month old baby is a terror suspect, and a guy who killed innocent afghan civilians, is a crazy man..??? Astaghfirullah.